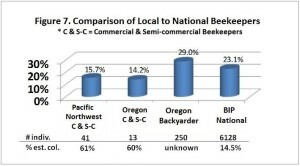 The pnwhoneybeesurvey received responses from 250 backyard beekeepers in 2015. Overall overwinter losses of individuals with either 8- or 10-frame Langstroth bee colonies was 27%; factoring in total backyarder losses for beekeepers entering winter with Langstroth, Top Bar, Warre, 5-frame nucs or other hive types was 29%. 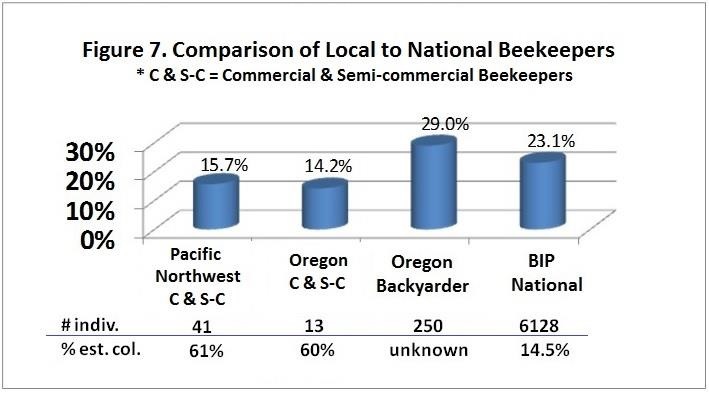 Our annual OSU survey of commercial and semi-commercial beekeepers (13 OR individuals maintaining some 60% of the estimated total colonies in the state) was 14.2%, somewhat below the commercial/semi-commercial beekeeper loss rate in the Pacific Northwest states of OR, WA and ID combined (=15.7%).The BIP national survey that included both backyarder and commercial beekeepers, reflecting survey responses from more backyard individuals but the majority of colonies were those of commercial beekeepers, reported a slightly lower overall loss of 23.2% . This is shown graphically as Figure 7 below. 44% of responding individuals used more than one monitoring technique (both visual inspection methods were often checked for example). We know the most reliable technique for examination of mite populations within a bee hive is via use of alcohol washing or powdered sugar shake. 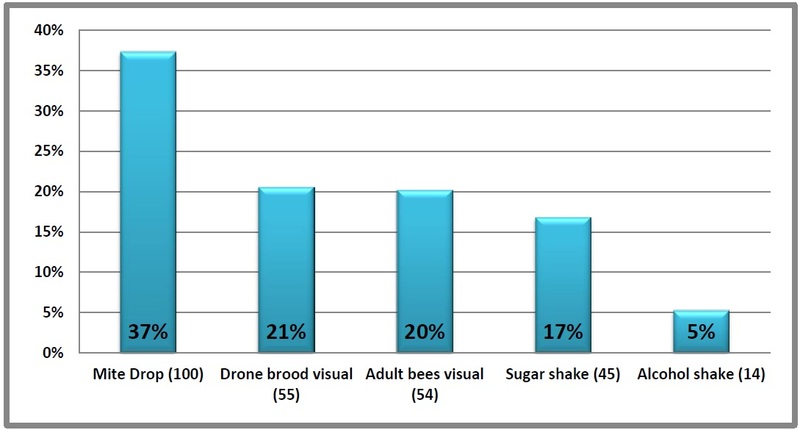 When we compared the individuals who used each technique (whether singly or in combination with another technique) and the reported loss by the same individuals, the result illustrates how significant monitoring with sugar shake was as this group had significantly lower overwintering losses (22%) compared to those who did not monitor (89 individuals – 31% loss) or used visual monitoring (29% and 31% loss rates -see graphic below). Those who checked sticky board also had significantly lower losses (22.5%). Individuals (14 total) who used alcohol washing did not show reduced losses, in part, because the variation among those 14 individuals was large. We asked in the survey about control, both with a varroa control chemicals and via use of a non-chemical technique. In the options for non-chemical control, we received 406 responses from 75% of the individuals – 25% (49 individuals) did not indicate use of any of the choices nor fill in the other selection opportunity. Ninety-seven individuals (51%) ireported use of 2 (56 individuals) or 3 or more techniques (41 individuals). The graphic below shows the percent loss response for the alternatives offered, minus the 150 individuals (37%) of responses who checked use of screen bottom board (which is reported in a different report on the pnwhoneybeesurvey.com website – under Screen bottom boards.) Losses for each alternative are irregardless if they used only that technique alone or used it along with another/other methods. There is no statistical difference between the data points. None were widely used. Individual selections varied from 49 individuals who checked nothing used to 21 individuals who said they used the technique of requeening. Numbers were relatively small and variation was large. The only value that was below the 27% average loss was use of small cell/natural comb (24% – most responses seemed to be the natural comb choice). 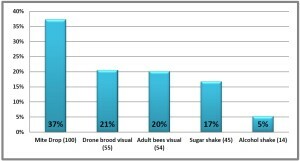 Largest loss values were for requeening (36%) and brood cycle interruption (39%), the two techniques that are usually listed as viable, useful non-chemical controls. Why they are on the high end of the loss scale is unknown. For the users of 8 and 10 frame Langstroth hives, we compared the percent loss of individuals who used a chemical control for varroa mites (142 individuals) to those who did not. The loss rate of those using a chemical control were one-third as large as the overall group and were nearly double for those who did not use a chemical control. Results were statistically significant from the total loss of this group of 27%. Examining individual choices (50 individuals reported use of more than one chemical) show use of three materials,resulted in significantly lower overwintering losses. Graph below. Beekeepers have various options for Varroa control. The key to better overwintering is to monitor using sugar shake or alcohol wash to determine infestation level of a colony and then depending upon the season deciding on what might be an appropriate chemical or non-chemical technique to use to reduce mite populations. In this survey response we were unable to demonstrate the usefulness of non-chemical use to reduce overwintering losses. The BeeInformed Survey 2014-2015 preliminary results does support our belief that non-chemical approaches can be useful and the Honey Bee Health Coalition website Tolls for Varroa Management guide Varroa management guide provides information on usefulness of an integrated non-chemical and chemical control approach to varroa mite population management.